Bohl said he likes how junior backup quarterback Nick Smith is throwing the ball in camp, and also said true freshman wide receiver Jared Scott — at 6-6, 230 pounds — came up with a “great play” during practice. Bohl added he isn’t sure if UW will play or redshirt Scott this season, but that decision should come “over the next several practices.” Bohl also said Smith has a good grasp of the backup job, and that it’s unlikely at this time that true freshman Tyler Vander Waal would become the No. 2 guy. However, Bohl said Vander Waal has showed some good things so far in camp. Bohl likes how junior wide receiver James Price is performing in camp, and how he’s taken on more of a leadership role among the receivers. Sophomore defensive end Shiloh Windsor was back in concussion protocol Monday. Windsor has missed time during camp with a concussion, but was back on a limited basis over the last few practices. Bohl said junior nose tackle Sidney Malauulu (back) participated in all of Monday’s practice. Malauulu has been limited with his back issues, but he told me Monday that he will be good to go when UW opens the season Sept. 2 at Iowa. Senior fullback Drew Van Maanen is one of the funniest and most charismatic guys on the team, and every year he initiates a different look for the fullbacks and any other player on the team that wants to join in on it. 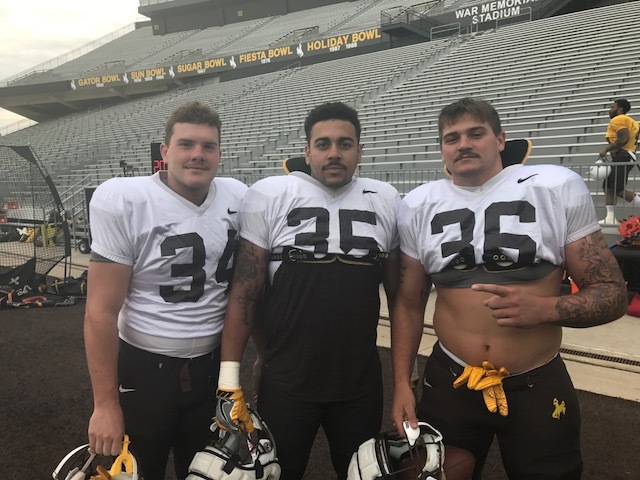 This year it is mustaches, and here is a picture of the how UW’s top three fullbacks look so far. This entry was posted in Football and tagged Austin Fort, Craig Bohl, Drew Van Maanen, James Price, Jared Scott, Jaylon Watson, Jeff Burroughs, Josh Harshman, Nick Smith, Shiloh Windsor, Sidney Malauulu, Tyler Vander Waal, Tyree Mayfield, Wyoming Cowboys, Wyoming Football by Robert Gagliardi. Bookmark the permalink. Thanks for all that you do. I really enjoy your work!